ESII has been offering solutions for more than 35 years to optimize the reception and reduce the wait for visitors. From this experience, we learned 10 tips to optimize waiting time in your store. A good reception starts before the meeting between the visitor and the salesperson! Thanks to ESII solutions, you can access statistics about your activity that enable to see the flow of visitors over time (over a day, a week, a month, a year). Offer appointment booking for the current day (virtual ticket) or for another slot time to allow everyone to come at the time that suits them and guarantees a near zero wait. Define a reception strategy to automatically direct customers to the right salesperson or the right reception desk. The reception quality is determined by the experience of each visitor and even more by their feelings throughout their journey in your store. For those who want, you can offer self-service thanks to the interactive kiosks where they will be able to inform themselves, select the service they want to access, consult maps … You have also to be completely transparent with your visitors by giving an accurate estimate of the waiting conditions: before they come, on your mobile application or on your website; on location through screens, thanks to the paper tickets or to Weasy, the connected card. A good reception is also part of the missions you give to your salespersons. To be more efficient, you should make their work easier and avoid generating stress. Provide them with useful information about your customers, with full respect of the GDPR: requests, customer ID number, order history… You also facilitate their work with a personalized reception strategy that allows to reduce the number of customers in the over-requested services, to assign salespersons where they are needed… You optimize your resources! 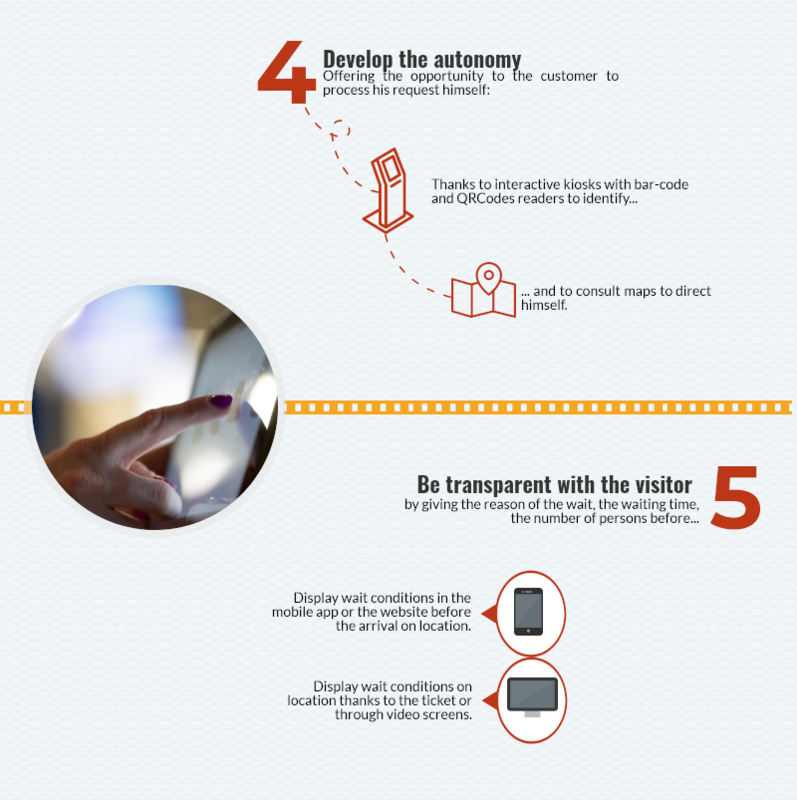 You already follow these tips and your reception is at the best? You can keep improving your reception by implementing a quality approach. 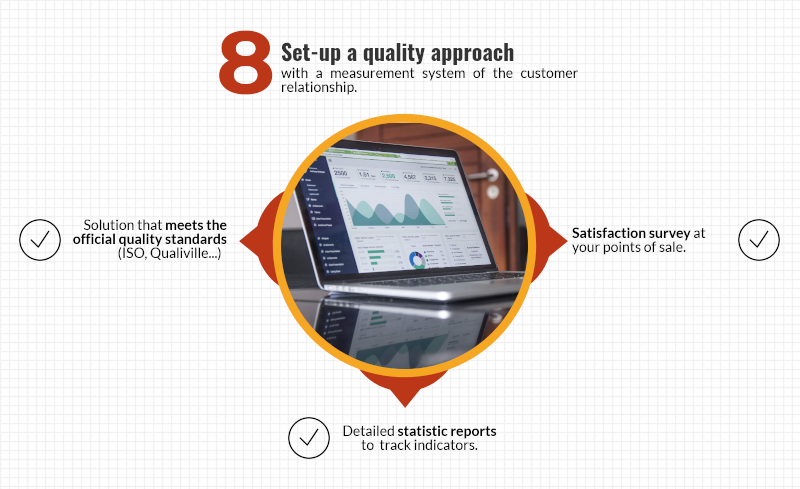 Our solutions meet most of the requirements of the official quality standards (IOS, Qualiville…) and allows you to track the evolution of the Key Performance Indicators thanks to detailed statistic reports. Finally, let your customers make a feedback about their experience in your store. Offers satisfaction surveys at the end of the customer journey on interactive kiosk or by e-mail. Sometimes, you can’t avoid waiting time! But it’s not necessarily negative, it can be an opportunity to sell more. 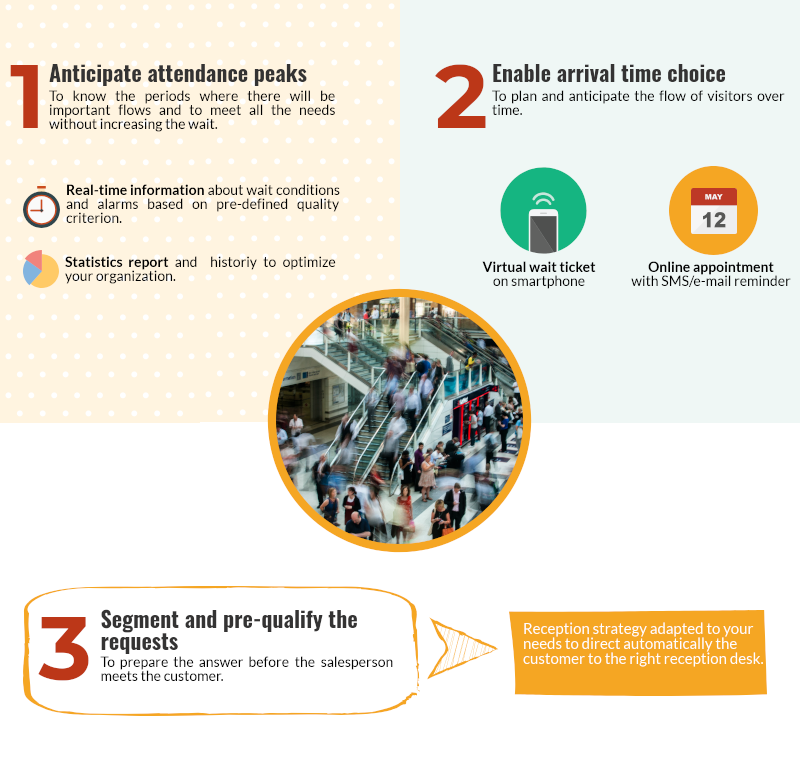 With a paper ticket or a digital one, the customer doesn’t have to queue. He can browse the store. The digital signage allows him to be informed about his call, but it can also display discount offers or promote products.